I love Cross Examined and highly recommend their ministry. However, that does not make them infallible. So here is some comments on a post they made. The proper interpretation of Genesis One. The question of the fall of man, human sin and its consequences. The scale and scope of the Flood of Noah. Also, creating the universe and stars, but not creating light until much later!? "(This is of course illogical, for why should God create light in Genesis 1:3 if stars were already shining brightly?)" There is a lot of information in the syntax article I link to above, including references to Exodus and Jesus' words in Mark 10. The writer seems to leave out his logic for arguing why death preceding the fall is important for his view to be correct. Normally you only need death before the fall in order to argue for evolution and survival of the fittest. However, Cross Examined does not support macro evolution. I believe their article is trying to say that the earth may have existed lifelessly for billions of years between verses 1 and 2. If true, this would allow for an old earth and Genesis 1 to co-exist. So why try to posit pre-fall death? I will try to respond still. "Some type of death and degradation preceded the fall." "The Tyrannosaur was a machine designed for killing." "Then we have the fact that the names of the animals which Adam named prior to the Fall have connotations of violence." a quote from that article: "The names in the Hebrew Bible for specific animals came after the Flood." "As I said previously, Adam did not die physically on the day that he ate of the tree, but lived a full life afterwards." A better translation would have said: "… for when you eat of it you will surely begin to die." They do a much better job than I at showing why the flood should be taken literally and historically. The writer of "Why I reject a Young Earth" does not make a watertight argument against the flood in his three paragraphs. Even if we allow for "on the earth" to be ambiguous between the entire earth or just the known earth, what about the later portion of the verse that says, "under the entire heavens"? To draw the conclusion that the author of this verse did not mean the reader to understand this as referring to the whole earth is difficult when two separate sections of the verse seem to indicate the whole earth. This verse could have said "under heaven". "Moreover, it must be borne in mind, the Hebrew word for mountains, har, is a general term referring to any geologic relief, from a small hill up to a towering peak"
I would think that the word "high" before the word mountains would make it clear which meaning of har is being used, but that is just me. Maybe that is too simple and I missed something? It seems to me that the author of Genesis 7:19 went to great lengths to be clear. Stating things twice and using adjectives to make sure you knew how tall the mountains were. 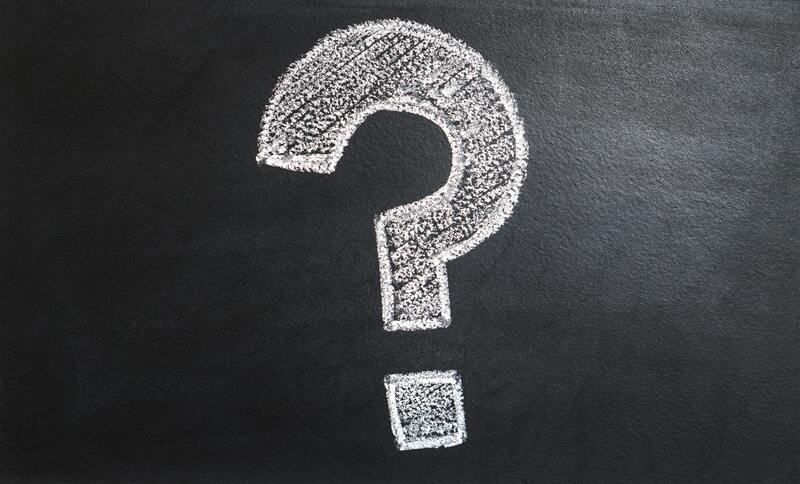 So many parents are scared that their child will ask a tough question and they won't have the right answer. This is backwards. You should be much more scared that they will ask someone else the tough scary questions in life. If you want your children to follow in your faith, and maybe even be stronger in their faith than you, then you should encourage them to ask questions. Even if you have no information on a topic and you get caught off guard, you can still respond positively. Here are some sample ways to respond for a topic that you might not know much about. Child: Hey Dad/Mom what do you think about [insert tough question here]? Parent: That is a good question! Thank you for asking me that question. This is a topic I would like to learn more about too. How about we buy a book / contact the youth pastor / research this together? Child: Hey Dad/Mom I am not sure I believe in Truth/God/Jesus/Christianity/Going to Church/etc...? Parent: That is great that you are asking yourself this question. Thank you for sharing your doubts with me. This means you are starting to develop your own beliefs instead of just borrowing them from me and mom. We should believe what is true, not what our parents say is true. How about we start seeking the truth together? Here are some curriculum and courses I recommend if you want to learn to defend your Christian faith. If you are not ready for a course yet, checkout the links on my resources page and start reading. 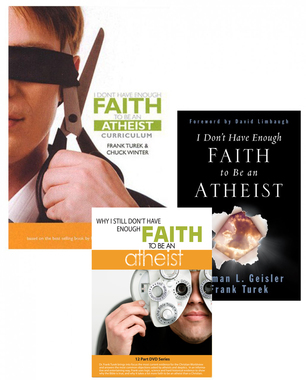 Be warned: If you take one or all of these studies/courses, you will be able to sound rational, reasonable, logical, and intelligent when someone challenges you about why you would be foolish enough to follow a blind religion like Christianity. Because of this, today's believers live very similarly to non-believers. A personal sense of significance is rarely experienced, we spend our money and time on things that fail to satisfy and we begin to wonder what life's ultimate purpose really is. We are, in short, losing our bearings as a people and a nation. 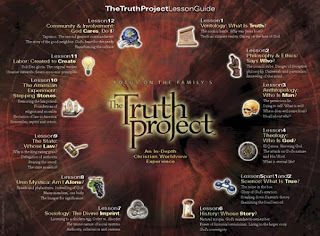 To counter this slide within the body of Christ, Focus on the Family has launched one of the most ambitious and powerful projects in the history of our ministry - The Truth Project. 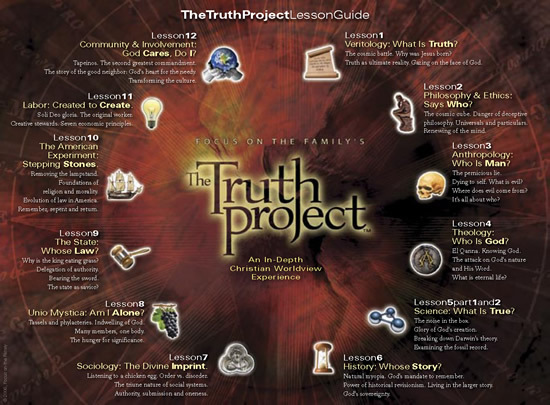 The Truth Project is a DVD-based small group curriculum comprised of 13 one-hour lessons taught by Dr. Del Tackett. 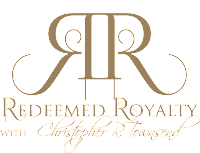 This home study is the starting point for looking at life from a biblical perspective. 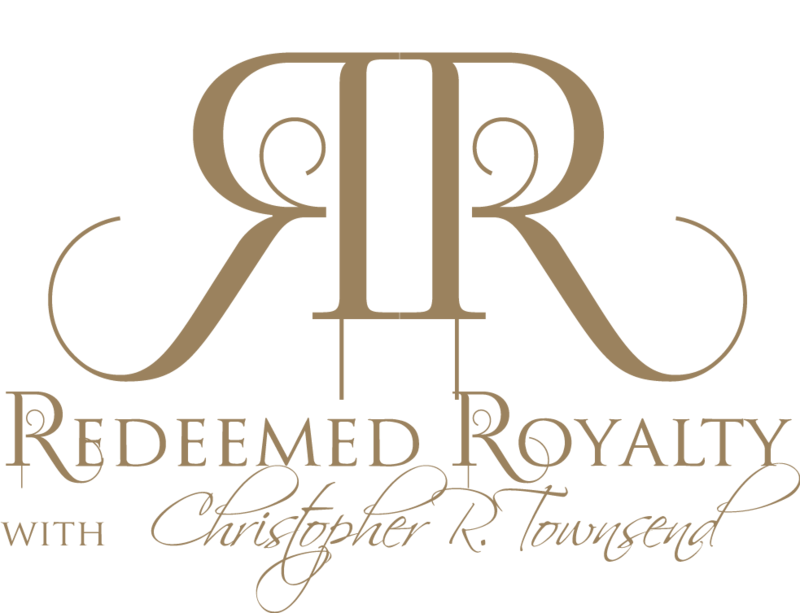 Each lesson discusses in great detail the relevance and importance of living the Christian worldview in daily life. We believe this one project represents the possibility for exponential change within the body of Christ; millions been transformed by this curriculum. As it has been throughout history, God continues to call ordinary people to make an eternal difference in our world. We invite you to be a part of this cultural change by participating in or leading a small group of your own. Contact us to learn how you can get involved in Focus on the Family's The Truth Project! It is no secret that the Church is having some trouble communicating to the modern culture. 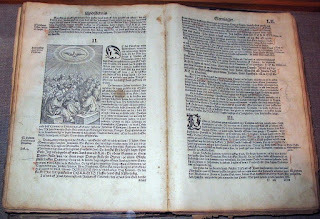 A lack of understanding and difficulty translating biblical truth into modern language and context has resulted in a mass exodus from the Western Church. Each year, more and more people are falling into "Post-Christianity" - either rejecting the Church, God, or both. This book is designed to help believers better understand the language and presuppositions of contemporary culture, as well as the arguments for God's existence and the reliability of the Bible. Readers of this book can expect to find answers to questions of faith and reason, belief and disbelief, science and religion, and much more. This book will help you learn the art and science of understanding and articulating why you believe what you believe. CIA is an intense three-day program where you will learn how to present I Don’t Have Enough Faith to Be an Atheist—which involves four main topics: Truth, God, Miracles and the New Testament—and how to answer questions about those topics in a hostile environment. During those three days, in addition to hearing lectures and participating in discussions, you will be asked to present a portion of I Don’t Have Enough Faith to Be an Atheist and answer questions from several instructors including Frank Turek, Greg Koukl, Richard Howe, J.Warner Wallace, Brett Kunkle, Sean McDowell, Bobby Conway and others.